I would like to say that I don’t really like micromanagement in most strategy games. I find it either too "micro" or too boring – it just requires me to stay focused on many minor details while I’d rather look at he bigger picture. Another thing worth mentioning is that I feel micromanagement in ancient times needs to be different compared to how it would feel in modern times or in a sci-fi setup for example. In ancient times most of the time urban centers managed their own things; the natural life of cities was regulated by local situations and needed not to be managed through frequent orders from the capital. Cities, their population and resources were mobilized only during perilous times when necessary war preparations had to be made. We followed this line of logic as well. The main function of cities is to generate wealth and to build and maintain units which deplete city capacities and resources. Leaving cities “idle” allows them to follow their natural growth and use their resources where needed. When you task the city with work, being either the constructions of improvements or the recruitment of new units, the resource production of the city is decreased. This principle reduced micromanagement from "this is what I have to do" to "this is what I can do" and it seems that beta testers appreciate it. So you might ask: what to do in time of peace? Let me first explain the concept of a city. Cities are the backbone of the state infrastructure concentrating large bodies of population and power in one place. Their size and position greatly affect its defense capabilities and its ability to harvest on the neighboring tiles. Every city has a so called "range" which is basically a set of nearby tiles adjacent to it. This range expands with the size and the number of citizens living there (we covered population growth in one of our previous diaries). Food and wood are harvested on tiles lying within the city range which means that larger cities work larger areas and so produce more food and wood. A city itself consumes resources while producing some others but production and usage of resources by the city depends on its size - the bigger the city, the higher the production and also consumption. For instance, a very small city produces very little knowledge because all its people are busy farming, mining, etc. As the city grows and with it its population, more and more people can have other occupations (philosophers and scholars) and so the output of knowledge in the city increases. City size is nonlinear, meaning that having many small cities is not the same as having a few very large ones. E.g. two cities with a size 2 have together a smaller population (and therefore also production and consumption rates) than one city with a size 4. However, city size also has a very important side effect. The larger the city, the stronger its defense, and it’ll be more difficult to conquer it for anyone. On the other hand, bigger cities give bigger loot once conquered. As mentioned above, tiles within a city range are important for harvesting food and wood. Arable lands around cities can be cultivated by building fields and farms to multiply food yields from each tile depending on the technological development of the country. Sea tiles also provide food in abundance. Terrain which is not suitable for agriculture such as forest, swamp and jungle can be “transformed” by cutting down the woods or draining them. However, one has to be careful not to deplete precious sources. Clearing a forest means that you immediately gain relatively large quantities of timber and make more space for fields but you will not be able to harvest wood on that tile ever again. Romans cut down many of their forests and then had to import wood from far away provinces. As with any centre, maintenance and upkeep are necessary. 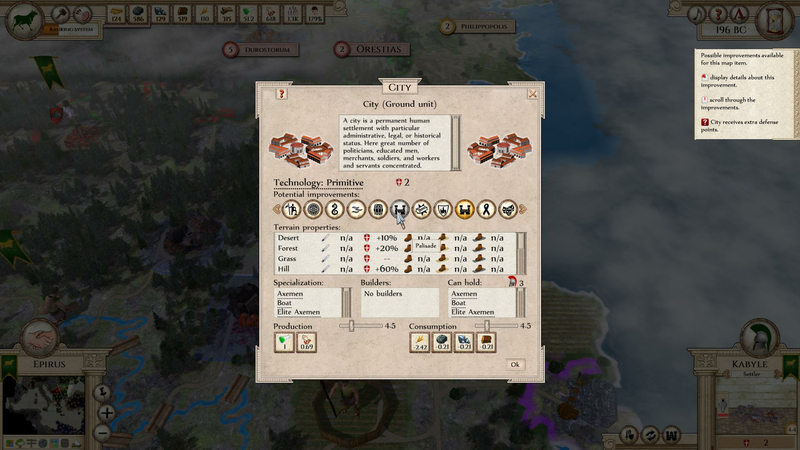 The concept of city improvements is similar to units improvements as discussed in a previous diary. Cities can improve their infrastructure by building military (stockade, palisade, city walls), economic (trading centre, economical city), political (amphitheater, obedience, civil service), cultural (academy or schools) or urban improvements (hospital, sewers system) that can have a major effect on the defensive function, resource production, cultural and social life of the city. For example, improving cities with Sewage system protects them from the spreading of infections and diseases, while building Civil service reduces the risk of local revolts. There are currently 16 city improvements and I am sure you don’t want me to spoil all the fun by revealing them all here. Many 4X games treat cities as the "absolute centers" where all power and activity is concentrated. However, facilities outside of city walls often were of great strategic importance so we introduced the concept of "buildings" into the game. These are standalone facilities such as blacksmith, temple, shipyard, fort, defensive walls, patrol tower etc. that greatly affect the economic life as well as the military capacities of the state. Another very important aspect of state management are good communication lines connecting all parts of the empire. There are two types of roads – dirt and paved roads and they have a great impact on the economic and military development of the country. Just like with anything else in the game, you will have to research them through technology. Mines connected to cities and blacksmiths by roads significantly increase their resource production. Roads allow units to move faster over all types of terrains and their use also reduces the overhead costs of trade exchanges (you can find more about trade in the previous diary). 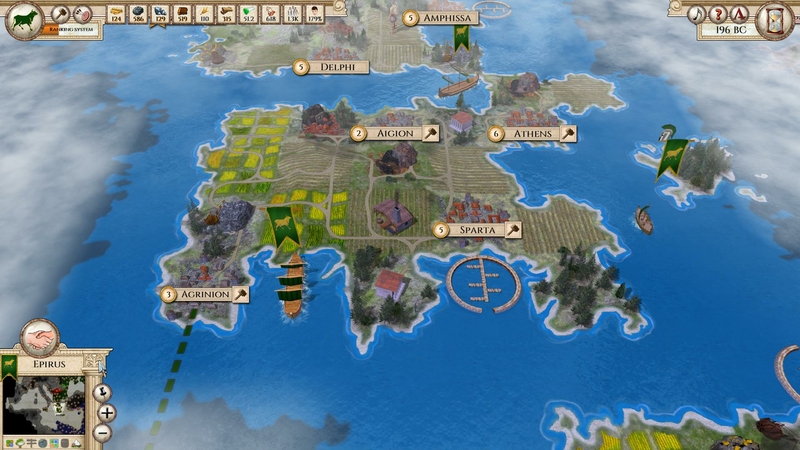 Roads also allow you to provide constant flow of supplies to your armies. Units left in foreign lands without food, armaments and other necessities rebel and can cause trouble so you should plan your road network in advance to support future territorial expansion. Behind your advancing units should always come road builders to ensure sufficient flow of supplies. When it comes to roads I should not forget to mention bridges. Rivers aren’t just a map feature but they have an important military dimension. They create a barrier which is not easy to traverse. Some unit types cannot cross rivers at all if the other bank is not already in their hands. Others can cross them but with a significant movement and defense penalty. That's why rivers have a great defensive potential. You can mitigate all river penalties simply by building a bridge. Should you be forced to retreat, you can always destroy the structure and leave the hard choice to the opponent – either accepting the river as a new border between your states or crossing the wild stream without a bridge and risking a slaughter in an attempt to reach the opposite bank. These are the most important parts of a micromanagement in Aggressors. 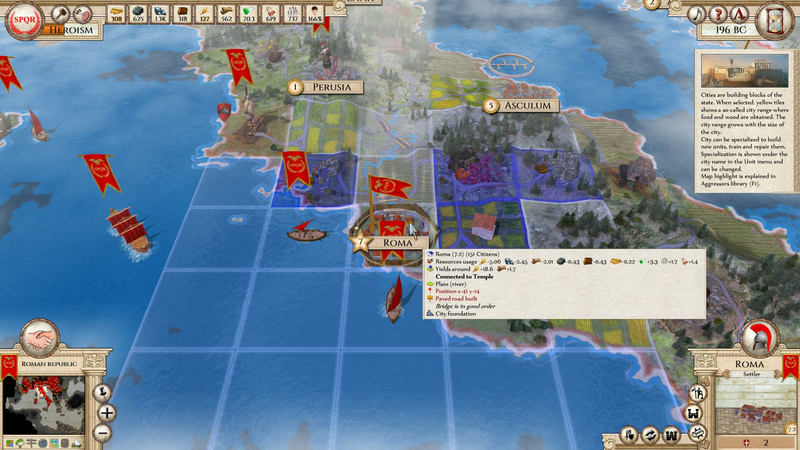 I believe that gamers who like the “building” part of 4X games will enjoy the given options to improve their empire without being overwhelmed by repetitive tedious clicking and enjoying the game itself. Initially this dev diary was planned to be the last one but we decided to give you a bonus one. I already look forward to it because next time I will show you our map generator and its possibilities. Last but not least, tune in this evening at 8 pm CEST on our Twitch channel for a preview stream of Aggressors: the strategy master DasTactic himself is going to play!